BBC NEWS | UK | UK Election 2005 | Have Your Say | Why are first-time voter numbers down? Less than a third of first-time voters say they will definitely vote on May 5, according to a new survey. Only 31% of the 1,078 first-time voters polled by ICM for BBC Radio 1's Newsbeat plan to participate, down from 38% in a similar poll in 2001. Asked why they were not interested in voting, 32% said they "can't be bothered", 30% said their vote would not make a difference and 20% said they did not know enough about politics. Are you a first-time voter? If so, will you be voting? Why do you think first-time voters are staying away from the polling station? This debate is now closed for polling day. Thanks for your comments. Whether you increase the voting age or not there needs to be political education in schools. I'm 19 and will be voting tomorrow but I had absolutely no idea about who to vote for and have had to do loads of research. Perhaps if young people were introduced to politics at school they would take more of an interest. OK, so it's partly the fault of the politicians for putting people off. But if those 70% of first-time voters who can't be bothered or won't vote actually got up and did something it equates to many thousands of votes. That could seriously affect results in a lot of seats. If you don't do anything you have no right to complain about the government you end up with. It's no good leaving the voting to others. Anyone who's apathetic only needs to be directed to these Have Your Say pages - there's bound to be at least one comment that will get them thinking, which is the first step to getting involved. Contributing to the debate should be set as homework at school. I don't understand how the younger generation can be so ignorant of national affairs. I am 47, but nobody taught me about politics at school, but in my teens I read the papers, watched the news, talked with my parents and peers, and formed opinions. I voted first at the age of 18, understanding the issues. Is it that life is now so shallow, and celebrity driven, that late teens and early 20s simply don't understand why people worldwide, from South America to Ukraine actually treasure democracy? I fear for the future of our democracy, with the apathetic nature of today's youth. I thought it was very sad that in the local council elections two years ago, two old ladies, one 94 and one 86, insisted that come hell or high water they would get to the polling station to cast their votes. Two teenagers I met whilst canvassing said they could not be bothered. I am 22 and would never dream of not voting, it is a privilege to vote and others of my generation should realise this. I am a first time voter, yet I don't see it as a privilege. I regarded buying my first lottery ticket more exciting! After weeks of trying to decide who to vote for (in my opinion, none of the main parties cater for people like myself) I have decided to vote for the Green Party. Environmental issues should be cause for concern because if we carry on the way we are going; none of us may be here next time to vote. Our futures need to be safeguarded and non of the parties at present don't seem to care about this. Unfortunately, I believe that many first-time voters are not interested in voting, because they are disgusted by how politicians constantly mislead people, lie to people, and do not answer the given question by the member of the public. If I answered all my A level questions in the same way as a regular politician, then I would not get any marks for my exam. I am a first time voter, and I will definitely be voting - but I can see why people get put off. All this slandering and silly talk seem like kids fighting in the playground, not grown men discussing how to run the whole of the United Kingdom. I especially despise scare-mongering techniques by Labour, along the lines of: "if you vote for Liberal Democrats the Tories will win". I will vote Liberal Democrat, just because of those posters. When 69% of young, first time voters are not going to exercise their right to a franchise, why try and extend it to people still at school? This is a desperate attempt to push up voter numbers and it ignores the real problem of voter apathy. Based on the general apathy of younger people, it's clear they don't deserve the right to vote. Perhaps we should increase the voting age to 30? Perhaps if we had a democratic system of voting more people would be encouraged to vote. I'm a first time voter and am voting for somebody I dislike to keep out somebody I detest. My friends have the same choice. Having to choose the lesser of two evils like this puts a lot of people off. Most young people are not interested in politics because they have not met any real challenges yet. My guess is that the generation now coming to adulthood will meet their first real test when the oil stops flowing, although the lack of anywhere affordable to live may politicise them well before that. The key to catching young people's interest is in education. And only through education do you generate the political awareness required for an educated vote. Only through educated voting will this country improve. I think young people are not so much apathetic towards the election itself, more like they're apathetic towards politicians. I'm 30 and have never voted because it makes no difference who wins. The country will be run by a bunch of greedy corrupt old men no matter who wins, so what's the point? The only thing that's made me consider voting this time is the thought of getting rid of Blair, but I don't see how the alternatives would be any better. I am 19 years old and I haven't got a clue about politics!! I know why I have blue eyes and I also know algebra, but no one ever taught me about life and how to pay my council tax and water, what VAT is and why we need to spend £30million a day just to be a member of the EU! That is what I don't understand. Unfortunately I miss out on this election being my first by a few months so I can't vote anyway. But if I could, then I would but only because of the women who died. I wouldn't do it because of any political passion because I believe that today the only passion there is in politics is for how much money the politicians can get. I also think that they are all too interested in saying bad things about the other parties, rather then promoting their own. The system will not respond to young voters' issues because they don't vote. The system only panders to the needs of actual voters. As only a small minority of those below 30 votes the parties have no interest in policies to help these people. Take local income tax, the grey vote will love this issue, however this is going to make the UK even more expensive to live in for the under 30s and most cannot be bothered, they soon will be. I think the reason why many first time voters suffer from apathy, is because they cannot relate to many of today's politicians. There's a huge age gap there that really should be addressed. Approximately one in three first-time voters are intending to vote, while just one in six first-time voters live in the marginal constituencies that will decide the election. Suddenly, the young do not seem quite so apathetic. If politicians want to engage the electorate, they should provide the people with a voting system that does not effectively disenfranchise anyone living in a safe seat. It's pretty shocking really that people my age claim it's too hard, it's not rocket science for God's sake. As far as I'm concerned ignorance is not an excuse and at the end of the day you can only be responsible for your own actions anyway, never mind anyone else's. If you don't vote or write a letter then you shouldn't complain! I am a first time voter. The campaign has been running for a month, and the only information I have got is on the one leaflet posted through my door, that just tells me who is running instead of why they are running. Can we be surprised that voter turnout is so low? Why should someone have to vote, if they do not know enough about politics to make a decision on who to vote on then maybe it's best they don't vote. Is compulsory voting actually democracy? Surely democracy would be to have the right to decide whether to vote or not. I will be voting for the first time on Thursday. We are extremely lucky to live in a democratic society where we can peacefully change our Government and the direction of our country. This is not a privilege to be taken lightly - surely everyone has at least some preference as to where they want the country to go in the next four years? As yet none of the parties have made me sit and think "They sound good, I'll vote for them"
I'm a first time voter but I probably won't vote. As yet none of the parties have made me sit and think "They sound good, I'll vote for them" and unless any do before the election I doubt I'll even bother. Proportional representation would be a start, such that those voting in non-marginal constituencies could truly feel their vote counted. I remember feeling politics was boring and didn't involve me when I was young - why should today's teenagers be any different? 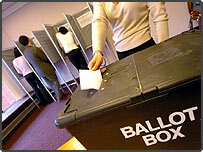 I am 19 and this will be the first time I will vote in a general election and I am really looking forward to voting. I am thankful to be living in a democracy and I feel it is a privilege to vote. I would just say to people complaining about the amount of young people not voting that they should look at their generation and see how many of them don't care what happens on Thursday before commenting! First time voter numbers are down because none of the candidates inspire them. The candidates are all middle aged politicians with middle aged agendas. It is odd that people have time to vote for some celebrity, or wannabe celebrity on absurd reality TV shows, but when it comes to the important decision of voting for their government, they claim they were too busy. Mindless and depressing. I am almost 30 now and I have always voted, but every single time I ask myself why? It feels like a chore, and the only thing that keeps me walking to that polling booth is that we have a Tony Blair led government that I want to vote against. I am voting for the first time. I'm proud to and believe it is my duty to. However, when I ask my friends I realise that I am in the minority. Politics doesn't interest them and they see the result as already decided. It's a shame. I'm a first time voter and I will be voting but I know many of my friends really aren't that bothered about who wins. It does seem politics doesn't affect young people. Also, most of the parties seem so similar, who cares who wins? If politicians made more of an attempt to engage with young voters then perhaps we'd have a higher turn out. Just before the 1997 election, a student told me that he was voting Labour because they would fully reinstate student grants. I explained that they wouldn't; but he didn't believe me. He still did vote Labour. First time voters would vote for any party that agreed to reinstate student grants (and abolish fees). Oh, and so would I - I benefited, so why can't today's generation? Pure laziness. frankly. You can bet the same non-voters will still complain about whatever affects them after the election, whilst they think half an hour and a cross on a piece of paper is too much hard work. Just make it compulsory, problem solved. Many first time voters simply do not feel the election makes a difference to them. They fully expect Labour will win and many will feel there is no need to change the government they have grown up under. And the only thing people can come up with to resolve this is "make voting compulsory". How naive! To be truly democratic, voters must want to vote, and have a system that encourages participation. Voter numbers are down due to general apathy in the community as a whole. Maybe it is time we made this important, and once every four to five year, task obligatory. Why don't we follow the Australian model and transform the right to vote into the duty to vote, with fines meted out to those too lazy to turn up at the polling station or send in a postal vote? Of course spoiling a ballot paper must always remain an option but surely it makes sense for those who benefit from democracy to put at least this much into preserving it? In a Radio 1 poll, a lot of young people said that they would be more likely to vote if they could use text messaging or the internet - so that'll be good old laziness then? I can almost hear the suffragettes turning in their graves. As a graduate from the good old free university days, I voted for tuition fees. Who's going to stop me? Our voting system means that only a few undecided voters in marginal seats actually decide the election. Each and every politician who bemoans 'voter apathy' should be challenged about where they stand on the issue of electoral reform. Here in Finland we have had the same problem. I have discussed with many young people about that. They say that politics is so distant and also not always fair play that it does not interest them. What to do with that? I think that school has an important role to educate young people understand how the decisions in democracy are made and what influence they have to everyday life. An interested question is also: what are your possibilities to influence as citizen? I am 34 and I have only now reached an election where I want one party to win. Previously I would have voted for 'none of the above' if there had been such a thing, but failing that have spoiled my paper. This time, there is one party that shows the moral backbone I want in a government. I'll leave you to guess which it is. I find it strangely ironic that the same people who say they won't vote because it "doesn't make any difference" are the same ones who willingly pay 25p to vote someone out of Big Bother or Pop Idol. At least voting in the general election is free. Most first time voters have either come to see how corrupt the system is or have not been targeted. Young people's issues are just not being addressed by the parties and that does not only include top up fees but things like the environment. First-time voters have come to see that no one reflects their ideals, so what's the point in voting for someone if you don't believe that anyone deserves your vote? If you live in a democracy it's your democratic duty to vote. So use your vote or one day we will all be very sorry. Once the turnout of voters dips below 50% the legality of the government becomes questionable, leading to violence and then heaven forbid, dictatorship via a coup. It couldn't happen in Britain could it? I would like to vote however, the process of registering as an overseas voter takes two months whereas the election is called just one month in advance. Who thought of this bright idea then? Not to mention the fact that I have to find another Brit living here in Toronto who is not my wife to sign the form, not as easy as it sounds! Voting figures have been low ever since Tony Blair pioneered the concept of 'spin' to win. Without the passion from the politicians and the contrived nature of their interviews it is difficult to become passionate. Bring back the soap box and you will bring back the voters. If all those young voters who said they will not vote as they do not think that their vote will make a difference did vote it would make a difference. If they feel that the main parties' policies are not applicable to them then go and spoil the voting card. The number of spoiled papers would far outweigh the number of votes made. If everyone did that then it would send a message to the government that electoral reform is needed. Any electoral system that allows a party with only a 40% share of a 60% turnout to attain a 165 seat majority or 63% of the seats in the Houses of Parliament, is certain to put people off voting. This isn't democracy and means politicians are only interested in the floating voters of the marginal seats. People want to believe that their vote has influence on the result or at least puts someone into parliament who will represent their views. This "1st past the post" system has led massive majorities given to parties who don't even have the support of 50% of the voting electorate. This system needs to be changed and parties must be forced to work together for the benefit of all of the people of this great country. When this happens people may start believing again in the political process and the need to cast their vote. PS. As the current electoral system does not allow me to cast a "None of the above" vote, I will be supporting the local independent candidate, who at least wants to represent the people of his constituency and not his political masters. I am 24 and would never waste my vote. I don't understand folk who don't take the opportunity to vote as most are the first to complain or turn up at demonstrations when they are not happy about something! As a female, I was also taught about what women in history went through to get this right and that alone will make me turn up at my local polling station on Thursday! The younger generation are no longer made to take responsibility for their actions so why should they vote in a system that still puts a party in power if the majority don't turn out. It's an empty gesture in the main and there are more 'interesting' things to do. Until they respect their role in society, are made to understand the results of their actions and appreciate the part they play (and the penalties they'll incur for not conforming to law and order) they'll continue to rebuke such trivia as worrying about who's going to ruin this once great country further for the next 4 years. I will be voting for the first time on Thursday but only because I feel it is my duty after people fought so hard to get the vote. I still don't know who to vote for, as all parties are saying things I like and dislike, with no real difference between them! I think that is the main reason people don't vote, as no one represents our views and they all seem to be saying the same thing just to please voters! The majority of young people in this country are so ill-educated that they wouldn't know any of the cabinet apart from Tony Blair and have no interest in who runs the country. They will also not know the difference between a parliamentary and a presidency election and they will think that the vote is about Tony Blair and he's the geezer wot started that bad war innit. First time voters must be so confused. We bang on to our young people about the importance of things like truth, integrity and decent behaviour, and look who they are being asked to choose between. Middle-aged men, slagging each other off, sliding away from direct questions, and shouting each other down. It's not much of an example to set, is it? How many policies are aimed at the younger voters? How many policies are aimed at the younger voters and more importantly, how many will improve the lives of younger voters? The answer - few and even fewer! Why should we vote? I think anyone not voting is a disgrace. If you want a 'none of the above' option then you can spoil your paper and it will still be counted. We should bring in the Australian system where you are fined if you don't vote. I would rather someone voted for a party I hated, than not vote at all. I suspect voter apathy, disinterest and the 'me-generation' affects. The apathy is self explanatory; the disinterest may come from the mistaken belief that politics isn't for those aged 18-24 and the 'me-generation' affect comes from a general impression that I have relating to younger people's motivation - if it doesn't affect them personally and now they're not interested or concerned. Social consciousness has changed and not for the better. In my opinion it's less intense, less philanthropic and less idealistic particularly amongst the younger population. I suspect a lot of non-voting comes not from apathy, but from the fact that our system is now too unwieldy. It needs to be made more relevant to people's daily lives, as politicians in parliament simply have too many issues for anyone to select on. The problem is that I have to vote for someone I don't want, in order to make sure someone I want even less doesn't get in. My vote, therefore, has no conviction behind it. Give me a 'none of the above' box! The MPs are far too scared of such a concept though as they would be wiped out! It is a fact that most votes cast do indeed not make any difference to the outcome, because of the "first past the post" electoral system. The only way to get the voters back to the polling stations is to change the electoral system to allow voters to place candidates in order of preference, or vote against candidates, so voters feel they have a real chance of influencing the result, something only those in marginal seats can do at present. A large number of first time voters are students, who don't pay taxes, and are far more interested in their studies and the pub at this particular time. Others don't see voting as 'cool' or anything that's relevant to them. When campaigns are targeted at the grey vote and parents, what else do you expect? Perhaps if we had a party we actually thought had Britain's, rather than their own, interests at heart, we might actually vote for someone? Also, I wonder if all those unused votes actually mean that the majority has no confidence in any party? I guess this is why the main parties are afraid to put a 'None Of The Above' box on the ballot papers. What's the point of voting? MPs are directed by the party whip and not the electorate, so your vote is not listened to anyway. When a million people come out to the streets to say no to war, not mentioning millions of others who where against but could not make it to the demonstration. But the government ignored all that and went ahead with its war. What is the point in bothering to vote? Because they can't remember the last Tory government, and with Labour having moved to the right, they can't see enough difference between the three parties. First time voters are always less likely to vote than everyone else, so I don't think these figures are remotely surprising. The UK is becoming more like America - people do not see themselves as governed, they do their own thing and ignore the ramblings of incompetent politicians. Young people are quite sensible to stay in bed on May 5th. I am a first-time voter and I do intend to vote. Even though I know that in my area my vote won't count, I intend on voting because if I don't then I don't believe I have a right to complain about how the country is being run. It annoys me when many people say: "I'm not voting because it won't make a difference". If everyone who said this did actually vote, the large numbers of people could make a difference. First-time voters aren't bothered about voting because none of the political parties are bothering to engage them. All the parties want to talk about are 'hard-working families' and 'hard up pensioners'. If you talk to young people they are interested in things that will affect them in the future such as the environment, long-term job security and how they will ever afford a house. All the current parties are interested in is 'here-and-now' policies that will win them a handful of marginal seats. Blair is responsible for the apathy. He has brought the credibility of politicians and politics to an all-time low. It wouldn't have been so bad if he didn't promise 'whiter than white' when he first came to power. The only answer is to make voting obligatory. The spoilt votes (abstentions) can then be counted and if these represent the majority of votes cast then there is a re-election with new manifestoes and leaders. I am not a first-time voter but the parent of three first-time voters. I am proud to say that they will all vote. Young people are not alone in feeling that their vote will not make a difference or couldn't care less. But we vote because the alternative is far worse. If everybody voted just think what a difference that would make to the whole political landscape. I am 24 and I have only voted once. I will not be voting in this election either. I consider it to be a waste of time, especially when all the political parties don't have any new policies which would interest me, so why should I give my vote? I really wish they would teach about politics and elections in schools as there are many young people who would vote if they could make an informed decision on which party is right for them, voter apathy is something that needs to be tackled or people like the BNP get in. Unless you live in a marginal seat, your vote will not count. For the sake of British democracy, we need proportional representation. I'm not voting yet, although I can for the first time, because England has taken the first step into freefall anyway so the next years are going to be bad whoever leads. Consumer spending has slowed and eventually companies that give Brown the opportunity of filching billions in windfall taxes to make up for his spending will vanish as will higher earners when even more new taxes are introduced to fill the gap in revenue. It's all there, stagnation, brain-drain beginnings, lies that are going to cost us badly, so why should I vote, especially as Labour, the main proponents of England's slow destruction will be back with another massive landslide, supported by the majority of the media anyway? The word 'sick joke' comes to mind... "allegedly"
I will vote, and I'm a first-time voter. However, I understand those who won't be voting because they think it won't make a difference - in some areas, they're completely right. If we had proportional representation more people would turn out and vote because it would count for something. I can't believe that first time voters are not taking up the opportunity. I still remember my first time. Perhaps we lived in more exciting times (late 1970s with the Common Market referendum and various elections), or the world appeared to be more inclusive and caring so the vote might make a difference. William Hague's political career was ultimately damaged by the public's recollection of his unnatural interest in politics at the tender age of 16. So why should we be surprised at 18+ year olds have a 'whatever' attitude to voting when few people grow up these days until they are 30? Or is it when they acquire their first lawn mower?